When my alarm sounded this morning about 6:15 a.m. my mind immediately starting thinking about the many things that need to be accomplished in preparation for the 100th anniversary of the Indianapolis 500. Then I remembered the storm … the ice … snowpocalypse! As about 6:45 AM IMS employees were notified that, along with majority of businesses and schools in central Indiana, our offices would be closed due to the massive amount of ice and snow that had accumulated over the last 48 hours. After working most of the day in the office at the house, I thought about what was taking place at IMS and decided I needed to get the facility. 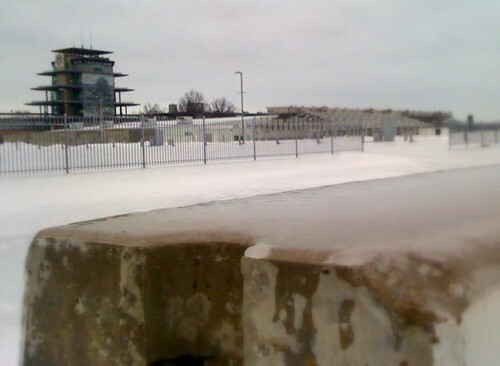 I knew there were people working to get the facility ready for tomorrow’s work day and I wondered what this 100+ year old motorsports shrine looked like wearing a layer or two of solid ice. At my heart, I am a fan of the IMS. It has been engrained in my DNA for as long as I can remember. 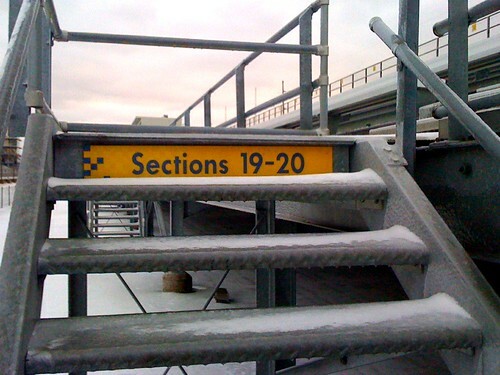 Because of that, I know how IMS fans are … we love this place all year long. 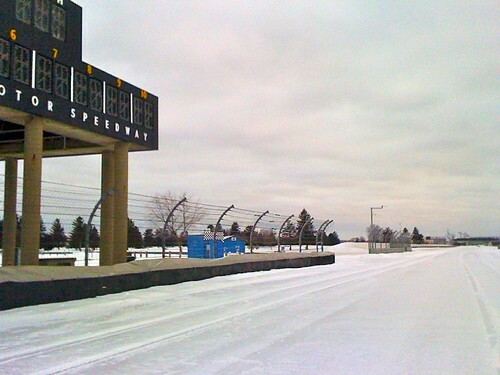 Like many of you, I remember how cool it was the first time I saw Gordon Johncock’s IndyCar parked on pit lane in the snow 20+ years ago. So, about 2:45 PM I closed my laptop, kissed my wife, said goodbye to the boys and jumped into the car to get some close up shots of what the Indianapolis Motor Speedway looks like when it is covered with ice! When I arrived, I met up with Paul Riley. Paul has worked for the IMS for 30+ years and there is nobody more passionate about the facility than him. Paul had been at the track since 4:30 AM and was still several hours from going home. I took my place in his Tahoe and went on rounds as he checked on the team clearing snow and ice at the IMS admin building, the Hall of Fame Museum and the INDYCAR offices. Most of the place was covered in two inches of solid ice. The east parking lot of the Hall of Fame Museum would have been perfect for hosting the NHL Winter Classic. After an hour or so with Paul, he dropped me off at the admin building and I tried to work at the office for a bit, but the track kept calling me. So I packed up, and decided to take my own car on my own tour – where I thought as I fan I would want to go! It was closing in on sunset and all I had was the camera on my phone, but I think I got a few shots that my fellow fans might appreciate seeing. 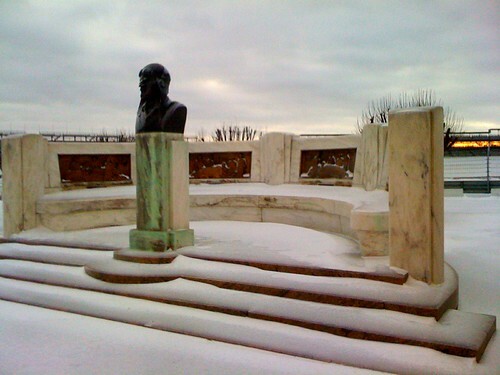 Find even more snow scene photos on Flickr by clicking here. is that statue Gaston Chevrolet? 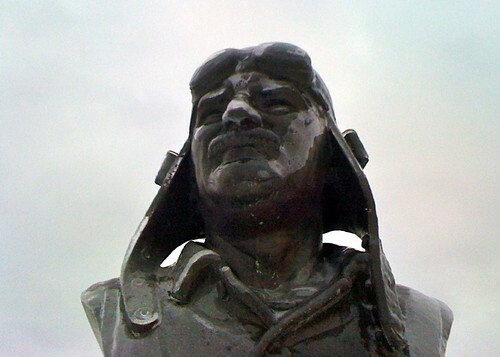 what is that monument for and where is it located? Those tour buses are rear wheel drive. I'm sure a good driver could hold that bus in a nice drift for a good quarter mile! 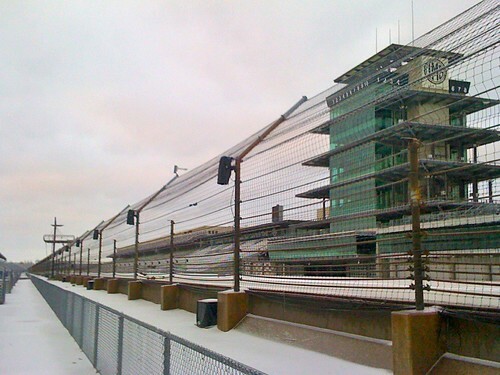 Where is that famous STP shot of the Indy car in Pitlane during a snow storm? Mmmm probably no bus tours, but I'll bet they had the Museum open!